Yesterday, those noble Nobel fellows, the same committee that honored President Obama—what was it? six, seven days after he assumed office?—, gave this year’s Peace Prize to the European Union. That’s right: the statue, or cup, or whatever it is they bestow, will be given to the bureaucracy in Brussels. And it’s no surprise. Why? Because those Europeans eat a lot of chocolate. 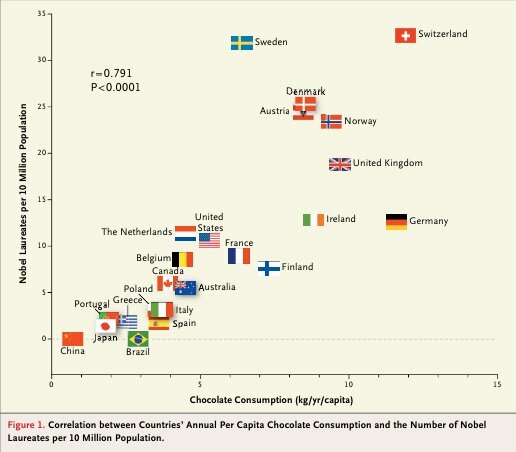 Just you take a look at the following picture, culled from Franz Messerli’s masterful New England Journal of Medicine‘s paper Chocolate Consumption, Cognitive Function, and Nobel Laureates (pdf). It should be obvious, but if not, that horizontal-axis shows chocolate consumption and the vertical-axis shows per-capita Nobel prizes. The more chocolate a nation eats, the more Nobels. The Nobels! There just is no more official designator of truth and goodness. There was a close, significant linear correlation (r = 0.791, P<0.0001) between chocolate consumption per capita and the number of Nobel laureates per 10 million persons in a total of 23 countries (Fig. 1). Look at that astonishingly low p-value! They just don’t come lower than that! That means only one thing: eat enough chocolate and the prize is yours. That’s why the EU won. How could anybody eat more chocolate than twenty-seven entire countries. I’ll tell you how: twenty-eight or more countries could eat more chocolate. These leads to a statistical predication that next year’s Nobel Peach Prize will go to World. Word is that some are already practicing their part in the acceptance ceremony. A second hypothesis, reverse causation—that is, that enhanced cognitive performance could stimulate countrywide chocolate consumption—must also be considered. It is conceivable that persons with superior cognitive function (i.e., the cognoscenti) are more aware of the health benefits of the flavanols in dark chocolate and are therefore prone to increasing their consumption. Good news for this hypothesis is that it too is decisively rejected—it also have a disappearingly low p-value. That means it’s true too! Finally, as to a third hypothesis, it is difficult to identify a plausible common denominator that could possibly drive both chocolate consumption and the number of Nobel laureates over many years. Differences in socioeconomic status from country to country and geographic and climatic factors may play some role, but they fall short of fully explaining the close correlation observed. Indeed they do fall short, stumbling well before the mark. And why? I’ll tell you: there is no p-value for this obviously offhand hypothesis, this whim. Classical statistics assures us: No p-value, no truth. Therefore, this conjecture can’t be so. Update See also Why Do Statisticians Answer Silly Questions That No One Ever Asks? Thanks to @benlauderdale where I first learned of this paper. Note Given this is the internet and that therefore one can never be certain, we do all know that Messerli is pleased to be jocose? I can see it now. In a near future rendition of a Sherlock Holmes mystery we get the following classic line: “Watson, I must retire to my den and cogitate on what may turn out to be a three Snickers problem”. Pretty funny, I didn’t know that NEJM had a joke section. All seriousness aside, I’m listening to a football game, so I did a little fact checking. First, I found some question about the per capita consumption data. More significantly, I looked at the distribution of Nobels by nation. The out of order nations might represent different baseline years, I used the current wiki data. Not likely in the case of #1 Saint Lucia and #2-Luxenbourg, each with two prizes or #3 Iceland, with only one. Along with Saint Lucia, Luxembourg and Iceland, many nations are absent from the NEJM article. I’ve already spent too much time on this nonsense to plot out the entire list myself. I guess that may explain why I’m not published, LOL. Obviously, the inhabitants of a nation celebrate Nobel Prizes by eating chocolate. Professor Briggs, this posting brings two questions to mind. The NEJM article appears to be using Nobel prize awards per capita as a proxy for “cognitive function”. Ignoring all the inherent potential problems with that and just assuming that it’s a perfect proxy, all we can really get is an estimate of cognitive function because of the limited data set. Intuition tells me that the estimate is probably a whole lot better for the US, with 336 Nobel prize winners, than for Norway, with 11 prize winners. So my first question is – how do you statisticians account for this? The chart in the NEJM article seems to ignore this aspect. One can imagine modifying the chart so the the US flag is 30 times bigger than the Norway flag, but that would just make the chart unreadable. Secondly, back on your 05-October article, “Correlation Implies Causation”, you state as a truth that “if there is causation, there is correlation”, and you seem to state it as if it should be obvious. This has been bugging me ever since. I can’t seem to grasp why it this is an obvious truth – can you elaborate? Perhaps I’m getting stuck because I see cause-and-effect as some inherent aspect of the universe that is independent of our ability to understand it, whereas I see correlation as an application of mathematics to a set of measurements, and as such very dependent on our math and measurement abilities. I’ll try a simple example. Suppose I spent a lot of time developing a means to surreptitiously subtly influence the path of the ball in a roulette wheel, and based on my trials on an actual roulette wheel in my garage, I was convinced I could make a lot of money. But my attempt to do so at the local casino ended in utter failure – there seemed to be no correlation at all. Unbeknownst to me, someone else had also developed such a means, and it was equally effective to my own, and he just happened to be sitting across from me at the very same roulette wheel! His efforts, too, ended in utter failure. It seems to me, as a practical matter, any net correlations could indeed possibly be undetectable.